Please contact the Club at kssclub@hotmail.com or Mel on 01926 642474 if you have any questions. Bikes under 25 years old on hard standing on the left hand side of the entrance road from the cricket nets back towards the entrance once full the gravel area can be used on the right at the end of the clubhouse. ‘Custom Bikes’ in a similar vein to the cars – bikes under 25 years of special interest (eg Customs/Exotica), please proceed to the area in front of the Hall on the right-hand side (just past the smokers shelter). Bikes over 25 years old to park in the area in front of the hall/Bar on the left-hand side by the field as usual. Cars/Vans/Pickups over 25 years old to proceed onto the field where you will be parked in rows parallel to the Hall/Clubhouse as usual. Area at the left of the field will be reserved for Groups plus the old Tractors/Buses/oversized cars etc if they come, please let us know if a group of you are coming and want to be together (ahhhhhhhhh!). 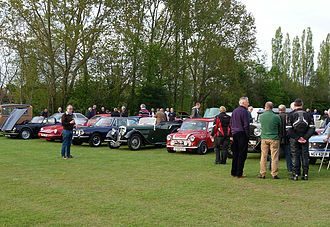 Any visitors attending in vehicles outside of the above categories should park in the back field behind the clubhouse, please obey the instructions of the Marshalls at all times when being directed around the site. Please can all Members/Guests/Visitors please keep speed down to 5mph on site,and drive/ride responsibly when arriving at/leaving the site.